﻿ I Inherited a Stamp Collection, Now What? This book started in 1995 when I inherited a rather large stamp collection from my mother, Ruth Myers, and my aunt, Julie Whaley. Actually, it was really four or five collections, because mom and Aunt Julie had inherited albums from other people. 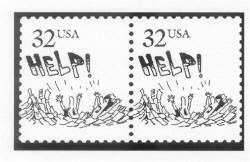 I had collected a few USA stamps as a child, but I certainly wasn't prepared for what I inherited. I wrote this book in an effort to help others in the same situation in which I found myself. This edition (the Fourth Edition) was issued in 2011 and is available for you to read in its entirety, for free, on this web site. The book consists of 27 chapters to help you make sense of a stamp collection you might have inherited. It also gives you some tips on options you have in dealing with the collection (e.g., selling the stamps, using the stamps as postage, giving the collection away, etc.). It is not necessary to read the entire book; not everyone will be interested in every chapter. The first few sentences of each chapter tell you who might benefit from reading or skimming the chapter. I hope this books helps! There is no charge to read this book online. If you like, you have my permission to print out a copy for your personal use. Please keep in mind, however, that I revise and update this online version from time to time. If you print out a copy, you'll miss all the changes. Libraries have my permission to print out one copy (or several copies) of the book to put in circulation. Again, please keep in mind that the book changes from time to time. Once you've printed a copy, you won't see the latest changes. You do not need to read the table of contents. You might take a minute to skim over the topics to see what we'll be covering. You can always come back to this page if you are looking for something in particular. 5.3 High, Medium or Low? 23.2 Where Do Fakes Come From? Click arrow to go to Chapter 1.